Anchoring can be a lovely and simple dance in the harbor or a furiously frustrating experience, the latter providing great entertainment value to fellow boaters already hooked. A bit of preparation can make all the difference as to which outcome you can have. Doing it right merely involves a few simple steps and a bit of advance planning. If for some reason a certain spot does not feel right, then it probably is not. Be flexible and move on. Let’s see what one can do to make it easy. 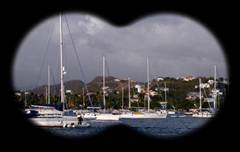 It is advisable to cruise slowly through an anchorage to inspect it upon arrival. Note how the charted depths and features relate to the actual physical appearance. 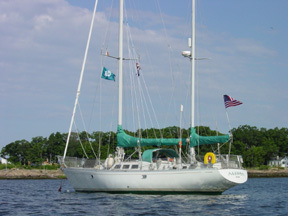 Note how other boats have anchored. If you cannot tell from what you see, don’t be afraid to ask your potential neighbors how much scope they have out or any other information that might help. When you are ready to anchor, drive in a circle around the perimeter of what you expect your swing to be to make sure there aren’t any obstructions, boats that could swing close, or variables in depth that are not on your chart. Your boat will swing - sometimes in a 360° circle. 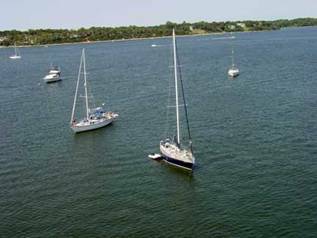 Keep in mind that catamarans, large vessels, powerboats or flat bottom boats will all swing with very different characteristics than sailboats. Some boats yaw to the extreme while others ride straight as an arrow into the wind or into the current. Take the time to observe the vessels nearby and try to anchor away from boats that move differently from yours. If there’s plenty of room, there’s no worry. It’s when the anchorage is crowded that this becomes an issue. When you’ve surveyed and chosen your spot point your boat into the wind and slowly head for the center of your circle. Stop the boat, and lower the anchor slowly to the bottom so that it falls with its flukes or spade in the proper orientation. Do not just drop the anchor and rode off the bow, as we often see people do. This is asking for trouble as the anchor and rode fall in a jumbled mess to the bottom. When the anchor reaches the bottom, or even before, start reversing slowly (or let the boat drift backwards if the wind is strong) and slowly let out some more rode  leave a little tension on the rode while doing so. This achieves two results: the anchor and chain are cleanly stretched out on the bottom, in the correct orientation and the rode is cleanly stretched away from it, and it starts to set the anchor. If you have a rope rode pause when it reaches about a 30 degree angle (about 2:1 scope), give it a couple of quick (gentle) tugs to set the anchor (you should feel it catch securely) while still paying out the rode as the boat moves astern. If you are paying out a chain rode, gently apply the windlass brake at this point to achieve the same result. That also helps keep the boat oriented into the wind instead of drifting sideways which so often happens when you just let the boat drift backwards with no manoeuvrability. Let out the some more rode and secure it on a sturdy cleat. Now make sure the anchor is securely set by carefully reversing your boat under power VERY slowly. Applying too much power will simply pull the anchor out. This is best done with one person at the bow and one at the helm of the boat. While the helmsman reverses, the other person carefully places a hand or foot on the rode stretching away from the boat. If the anchor drags, the vibration is easily felt. At the same time the helmsperson should take a sighting on a near and a distant point to see if the boat is moving. If you drag, pull up the anchor up and start the procedure again in slightly different spot, or you might try a different anchor. (Remember a different anchor may work better on a given bottom). Now you can let out the remaining rode. We will be discussing how much rode later on. In light air, or if you are at a location with changing currents, it is advisable to weigh down your rope rode. This will help prevent wrapping it around your keel when you swing if you have a modern fin keeled sailboat. We use a 4 pound lead weight or kellet, which we tie to the rode about 15-20 feet from the bow of the boat. If we then drift over the anchor, our rode is usually safely lying on the bottom. Choose a location that will be best suited for predicted overnight conditions (e.g., in the lee of a high shore). Prepare your anchor and rode on deck, and add a trip line ( a line equal to maximum expected depth attached to the shank of the anchor with a buoy to the surface) if you choose for ease of retrieval especially in problem anchorages. Check the tide to see where it is now, and how it is likely to affect the depth relative to your draft as well as to the amount of scope you will need. Drive in a circle around the perimeter of what you expect your swing to be to make sure there aren’t any obstructions, boats that could swing close, or variables in depth that weren’t charted. Your boat will swing, sometimes in a 360° circle. Point into the wind and head for the center of your circle. Stop the boat, and let the anchor drop slowly to the bottom. When the anchor reaches the bottom, start reversing slowly (or let the boat drift backwards) and slowly let out some more rode. This achieves two results: the anchor is cleanly on the bottom in the correct orientation, and the rode is cleanly stretched out from it. Now tug on the line repeatedly to set the anchor (you should feel it catch securely). Let out the some more rode and secure it on a sturdy cleat. Reverse your boat slowly to make sure the anchor is securely buried. Applying too much power will simply pull the anchor out. This is best done with one person at the bow and one at the helm of the boat. While the helmsman reverses, the other person carefully places a hand on the rode that is stretching away from the boat. If the boat drags, the vibration is easily felt. At the same time the helmsperson should take a sight on a near and distant point to see if the boat is moving. If it drags, pull up the anchor and start again in slightly different spot or with a different anchor. (Remember a different anchor may work better on a given bottom). Now you can let out the remaining rode. Use adequate scope. We use at least a 5:1 ratio (scope) rode:depth, as we have a rope rode with only 20 feet of heavy chain. Unless you have an all chain rode, attach a chafe guard where the line passed through the chock. With an all chain rode, add a snubber with a chafe guard. In light air, or if you are at a location with changing currents, it is advisable to weigh down your rode. This will help prevent wrapping it around your keel if you have a modern fin-keeled sailboat. We use a 4-pound lead weight, which we tie to the rode about 15-20 feet from the bow of the boat. If we then drift over the anchor, our rode is usually safely lying on the bottom. If you have an anchor alarm on your GPS, set it so it will keep watch for you overnight. You’ll sleep much better! Just always remember electronics are not foolproof. It always pays to stay vigilant. It is always a good idea to go topsides during the night to check things out; the weather may have changed, or someone else’s anchor may be dragging. But even if nothing has changed, you will also see how beautiful it is out there at night!